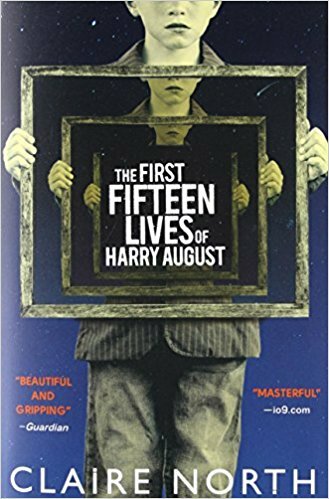 The First Fifteen Lives of Harry August by Claire North | Blah! Harry August is a unique individual: every time he dies, he relives his life, with his previous memories in tact. He is not alone, as there are others with his “power.” Claire North’s The First Fifteen Lives of Harry August chronicles, as the title says, the first fifteen lives that Harry lives, describing his brushes with history and with others with his power that have different plans on how to use it. The idea of reincarnation is of course not new, but the spin that North gives it here — that one might be reincarnated but in their original body to live again — gives this story a different direction. People like Harry can accumulate knowledge through the living of many lives, becoming experts at many different fields. Harry, through his life, studies religion, quantum physics, and medicine, all in an attempt to learn what his place in the universe is. A very cool touch is how people like Harry communicate beyond their own lifetimes to others with their power to understand how the world evolves beyond them. Knowledge from the future can be passed backwards through overlapping lives. There are two main themes of this story, at least that I picked up on. The first touches on our role in the universe. Do we have any special place, special role that we are supposed to fulfill? Harry has this special ability to relive his lives. Does this mean he also has some special purpose? Is his purpose any more special than anyone else’s? The second theme relates to knowledge, and what knowing does to us. Does it make us wiser? What do we do with that knowledge? If we know Hitler is going to destroy so many lives and we can kill him as a baby, is that overall good? What about unforeseen consequences? What if others learn you have knowledge of the future? Harry and his kind have great power — they know what the future will hold through their backwards communication. They can essentially experiment with world events and see if things turn out better or worse through the course of several lifetimes. But, they have found that history is too complex to control and thus they have settled into some kind of apathy, justifying any real action because of the complexity of the consequences. How do any of us justify our actions when a seemingly insignificant remark or activity may have a butterfly effect beyond our control or even comprehension? For Harry these questions are exaggerated as he has an even greater ability to understand the consequences of his actions, but this question applies to all of us, to some degree. I was out of shape, having never been in much of a shape to get out of, and my confinement had hardly aided the process. As I’ve said before, a great story is one that keeps you entertained while also exploring some deep questions. North’s story does just that. There is a strong action/adventure element (that takes place over the span of Harry’s fifteen lives) that serves as the backdrop to discussions on humanity’s role in the universe, the power of knowledge and technology, the consequences of actions, and the nature of good and evil. This is a great story that I highly recommend.